needles and lemons: How near is Christmas ? How near is Christmas ? The answer is VERY. Yes I know this is not what anybody wants to hear but we are almost in November and I think the Christmas lights are already up on Oxford Street (though thankfully not switched on). So how about some x-mas sewing then ? Don't panic, there is still plenty of time and whats more, inspiration and help is on its way. Next week the Christmas edition of the fantastic Fat Quarterly magazine will come out and... insert drum role here please.... I have a quilt in there ! I was so very excited when I was asked if I wanted to contribute to the Christmas edition. Excited for two reasons, one because it is just so wonderful to be able to contribute to this fabulous magazine and two that also meant that I got my Christmas sewing out of the way early. If I have to sew something for the festive period then I like to start early. Last year you may remember I started sewing my nephew's Advent calender even earlier in August (though I still got in a pickle in November). The marvelous FQ team have given me permission to give you sneak peak of my contribution. 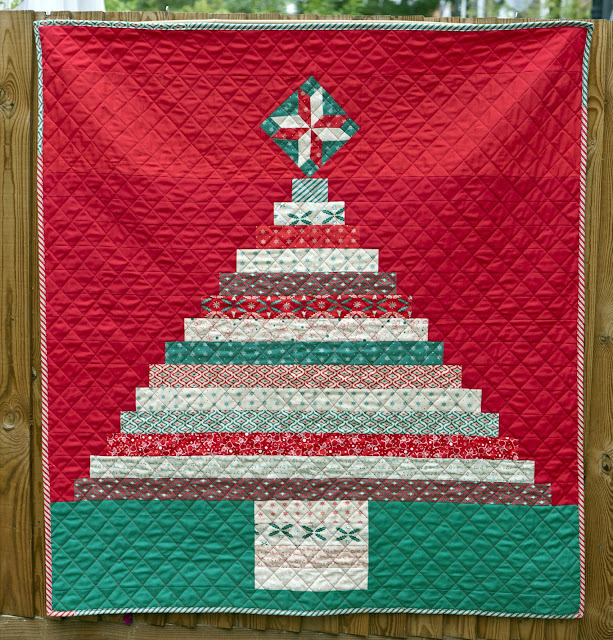 I made this Christmas tree quilt with the Dear Mr. Claus Christmas fabric by Cosmo Cricket for Moda and I absolutely love it. This is a very versatile quilt because it can be used as a wall hanging or laid out in front of the Christmas tree or you could just use it as a quilt for the holidays (what a novel idea !). The collection is modern while retaining the warm and traditional Christmas colors. If you want to know how to make this then you need to buy the FQ x-mas edition where you will find detailed instruction including templates for the star. Have a lovely weekend full of sewing. Love this fabric line, it's so retro and another awesome quilt! The binding is fab! Will definitely be buying the magazine, that xmas tree is gorgeous. Well done! It is beautiful Judith, such a lovely idea. I am looking forward to the release of the Christmas edition. This is such a fun quilt! Great idea of how to construct a tree. I also love Dear Mr Claus - very retro. I reminds me of the colour of Wrigley's gum packets when I was little! Thank you for adding to my panic!